Local Kine Chili - mmm-yoso!!! It's quite amusing sometimes, when talking to ex-pat Kama'aina's here on the Mainland...once you get past all of the initial pleasantries ("Wea you wen' grad? "), without fail the conversation drifts to food, and what we miss ("ohhh man W and M Burgers"), and where to get what ("eh, you seen Purity Port-o-gee Sausage?"). In these conversations there are a few items that have reach iconic status, I'm talking about eye-rolling, lip smacking(taste memory is an amazing thing), stomach growling, iconic status. And what may seem to be surprising to some, is that one of these items is Chili....really, Chili. More specifically, Zippy's Chili. Somewhere between 1966 when the first Zippy's opened, to say 1971 when the second Zippy's opened, in Kaimuki, just a block from where we lived(in the old Crown Drive In location), Zippy's Chili had already won the stomachs of many locals. At the time of this article in 2004, Zippy's was selling 150,000 of chili a month. Not only through the restaurants, but Zippy's Chili had become a big time fund raising item, and of course there is online sales, and you can even get the frozen version at places like Marukai here on the mainland. Now that's alot of chili...in Hawaii? Strangely enough, my favorite "local kine" Chili is from Rainbow Drive In, also pretty close to where I grew up. Even the Missus will get into the action, Her favorite is from Cafe 100. But still, the King of the Hill is Zippy's chili. Right about now, all you Chili Purists should probably come back another day.....what you may read in the following paragraphs may be graphically disturbing. I've been told by many mainlanders that what Zippy's serves, "isn't Chili". In fact if I may digress.....Once while still working back home we took one of our mainland contractors to lunch at Zippy's. Now this guy was one of those everything is bigger and better where I come from (guess the state? it begins with a 'T') kinda guy, the other thing was, he wouldn't ditch the suit and tie, a big no-no. So we took him to "Zip's" for some local flavor. And he orders the chili...when he get's his chili and crackers, he makes a face, and spits it back into his bowl, and goes off on a little rant, "this ain't chili, You People, don't know what chili is...." Now we were kind of used to Him, but the very large and muscular Polynesian Dude eating his Chili-Spaghetti Plate(with two scoops rice and macaroni salad) was not amused. So Bruddah with the biceps like coconuts, and trapezius muscles like the Koolau's, walks over and tells our guest; "eh, maybe wea' you come from, dis' isn't chili, but ova hea' it is. You think if any of these guys went visit you, and nevah like the food, dey would spit 'em out at the table? How do you say it.....you was raised in one barn!" And thus the nickname, "Barn-ey" was born........ He did learn what the term "No make A" meant after that. Back to the Chili I made, to be very clear, it's not Zippy's Chili, but I think it's pretty close to many "local" versions. The best that I can determine, it's a bit similar to Cincinnati style Chili. And many people enjoy it on top of spaghetti, or with cheese and onions on it. It isn't very spicy(though we like to add Tabasco), and uses a few different items, like ginger. As with items of iconic stature there has been much discussion as to the secret ingredient in Zippy's Chili, the items I hear the most often is Mayonnaise, and believe it or not Cream of Mushroom Soup, for this recipe I used some Mayo at the end, and it added a nice rich finish. 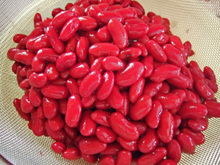 Another item I used is the liquid drained from the canned Kidney Beans, I think the canning liquid adds great flavor, and you won't need to add any salt. But, if you suffer from a pernicious reverse post-bean reflux.......I wouldn't add to your flatulence woes by using the canning liquid, and use water instead. Celery, Bell Pepper, Ginger, Pepper Flakes, and Garlic, stirring to prevent browning. 2 - Once the onion turns translucent, add the Ground Beef, and brown. 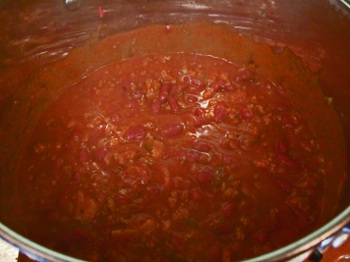 3 - When the ground beef is browned add beans, tomato sauce, tomato paste, bean liquid(start with 1 cup), beans, bullion, sugar, oregano,bay leaf, and cumin. Bring to a low boil, than reduce to a simmer. 4 - When chili has been simmering for 5-6 minutes, add in Worcestershire, chili powder(start with 2 Tb), red wine, and paprika. Let simmer for a few minutes, taste and adjust flavor. 5 - Simmer for 30 minutes, and mix in 1-2 Tb Mayonnaise. This time last week I was over there eating some really good food. More appropriately, ono grindz (?). The memorable meals in Honolulu were at: Sam Choy's BLC, Sam Choy's Diamond Head, Willows, Kaka'ako Kitchen. Of course stopping at Leonard's and Waiola Shave Ice. Yeah, it was an eating trip. Our one day in Hilo included breakfast & dinner at Ken's House of Pancakes, and lunch at Cafe 100. Didn't have enough time to get malasadas at Tex's Drive-In. Did you ever get to eat at Leong's Cafe in Kalihi? I didn't know it had closed. Hey Toisan - So did you try the Sumo Loco at Ken's??? ;o) I don't like the malasadas at Tex's too dense....Leong's, now that is/was major "old school", good stuff, and great pipikaula! Don't know when you went to Willows, but man, back in the 80's...we loved that place! I'm not a bigfan of Kaka'ako Kitchen....it's always been way to inconsistent. Before I moved to the mainland, I lived right down the street from Waiola, it's good stuff. For some reason I like BLC better than Sam Choy's DH, maybe because Alan Wong's is IMHO way better. You did get in some good grindz! I have yet to taste either Cincinati or Hawaiian style chili, but I could totally get into the cumin taste in chili--cumin is such an excellent spice anyway. I'd have to say, I do get obnoxious about some foods too. But I'd never spit something out and make a big deal out of it. That's bad form. Did you hear about the new dish Zippy's came out with? It's the chili loco moco. Sounds innocent enough, but guess how they do it? Perfect! I was just looking for a good chili recipe and your's looks fantastic. Thanks! that was very impolite of the associate from "T"....almost "broke da mouth" impolite. Hi WC - Do you use the bean juice? When I mention that I use the canning juice, I get some really weird looks...I use the bean juice in my Portuguese Bean Soup as well....and when I mention that, well, people tell me it's better if I would not had mentioned that to them! Hi DCCF - Most crock pot stuff tastes good, and especially good the day after! Beer and sake add some major flavor to food! Hi Keri - Happy New Year! I've missed you, and hope all is well. Funny, eh? Aina Haina was the first Zippy's...I didn't even know that! Hi Kathy - That's a bit much...even for me! Though the Missus loves the Chili Loco at Cafe 100, it ain't the cholesterol bomb like what you mentioned! Hi Lynnea - Well, I hope it turns out well...it's an easy recipe to adjust for personal taste. Hi Jo - My Mom, when a bit lazy would use those Shilling's mixes, but it was so easy to tell.....just like the "taco meat" seasoning! LOL! Hi RONW - Leave it up to you, to always make the most interesting...yet funny observation! But yes....we were all cracking up, but you shoulda seen some of the people we had in from a city that starts with 'P', from a state that starts with 'P'! I too do not care for Zippy's chili. Not enough body and character for me and it seems to be too watery. But my wife and daughter love it. My wife says that the secret ingredient in Zippy's chili is peanut butter. Have you ever heard of that? Nothing wrong with using bean juice, makes the flavor more concentrated. I tend to drain all my cans though to reduce the sodium content. Yep, Mill's & I were talking about it earlier. Scratch is best but sometimes you just gotta have... "Beef-a-roni" "Kraft Macaroni & Cheese" "Big Mac" "Ragu, traditional flavor spaghetti sauce from a jar" etc. Every few years, I just gotta have "Suzy Qs". Yet and still, I make the most killer cakes!?!? Is it the masochist in us? Like JJ, I'd heard that the secret to Zippy's chili is peanut butter. If that's true, they use a gentle touch so as not to overpower the Zippy's with the Skippy's. It's not the kind of chili I make when I'm making my own pot, but Zippy's chili can really hit the spot. Hi JJ - Peanut butter....I've heard Mayo and Cream of Mushroom soup, but not Peanut Butter. I prefer the chili at Rainbow's to Zippy's, but some of my friends are totally addicted to it. Hi WC - Actually, I use 2 cans "regular" and one can low sodium...and by using the canning liquid, I don't need to add any additional salt ot the dish. Hi Alan - If peanut butter is used, it's probably in a very small amount. I know people who have to hit Zippy's the minute they get off the plane! 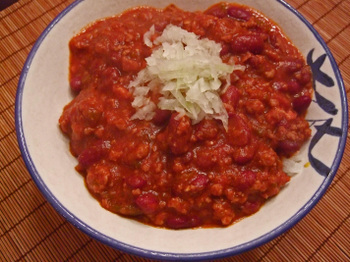 You can't forgot about the other "chili"...Tommy's Original. Its in the same category of chili and SOOO good. they sell zippy's chili here on island...at pizza hut. with like, a giant photo of sam choy holding a pizza out front. when did the you guys take over our pizza hut?! i'm more inclined to believe that zippy's chili is more like real chili than pizza hut's pizza is like real pizza. OH yea, instant ramen... I kinda think that stuff has a life of it's own. I like it fried with shredded cabbage and chopped peanuts!